Maysville Community and Technical College is dedicated to providing our students with a high quality, affordable education. We believe that everyone should have access to higher education and we offer a range of options to assist you in achieving your goals. Over 80% of students receive some type of financial aid. We offer federal and state grants, work study opportunities, loan programs, and scholarships. An $11 charge per semester will be collected from students enrolled in programs that require professional liability insurance. A $50 charge will be assessed for each check returned due to insufficient funds. Delinquent accounts are subject to referral to the Kentucky Department of Revenue, which will charge additional fees. A $75 charge will be assessed for reinstatement of classes for students who do not pay by the payment deadline. Tuition is due prior to the first day of classes for each semester, unless you have signed up for a payment plan to pay your tuition over time. See Academic Calendar for specific due dates. Tuition is assessed when you register for classes. If you do not pay tuition on time or make payment arrangements (payment plan, financial aid, etc. ), you may be assessed a late fee and/or unregistered from your classes. Tuition is charged per credit hour, so any changes to your schedule (for instance, if you drop or add a class) will result in recalculation of your tuition charge. Late fees and/or cancellation of classes apply even if you make initial payment but add a class later and do not pay for it. Billing statements are sent by email to your student email. You will not receive a statement through the mail. Your statement will show the tuition amount due as well as anticipated aid, including grants, accepted loans and some scholarships (including the Kentucky Educational Excellence Scholarship, or KEES). When you receive your bill, compare your tuition balance to your actual financial aid (available at Student Self-Service). If your actual aid is more than enough to cover your tuition balance, you do not need to make a tuition payment. Your tuition will be paid automatically from your financial aid. If your actual aid is not enough to cover the tuition balance, you must pay the difference by the tuition deadline. Contact the Tuition Office for help in determining how much you owe. If your tuition will be paid from financial aid funds, your tuition balance will not change until after the semester begins, enrollment is confirmed, and aid is disbursed to your account. At that time, your account balance will change to reflect the aid applied and any funds left over will be refunded to you. There are no additional charges associated with the verification of student identity. 1. Apply for financial aid Fill out your FAFSA! 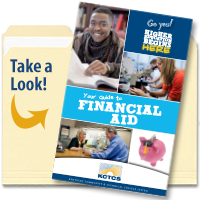 Financial aid begins here! Even if you don't think you will qualify, fill it out. You might be surprised. What is a FSA ID? An FSA ID is a username and password that students, parents, and borrowers must use to log in to certain U.S. Department of Education websites beginning May 10, 2015. How do I get a FSA ID? Beginning May 10, you will be able to create an FSA ID when visiting certain U.S. Department of Education websites. Provide your e-mail, a unique username, and password and verify you are at least 13 years old. After I get a FSA ID, will I still be required to use my Federal Student Aid PIN? No. Your FSA ID will replace your PIN as the way to confirm your identity when accessing your financial aid information through certain U.S. Department of Education websites. When logging in to these websites, you will be required to enter only your FSA ID username and password. Sign into your webmail account and click on New Account Activation to setup your account. In order to use financial aid to purchase books and supplies at the bookstore you must sign the Financial Aid Release form. Log on to your Student Self-Service account and submit the release on-line. Notify the Office of Financial Aid if you have received an award such as a scholarship or third party payment and it is not included on your award list. If you have requested loan(s) you must do Entrance Counseling and sign an MPN (Master Promissory Note) before the money will be released. 6. Check your Financial Aid To Do List. The To Do list is displayed under your Student Self-Service home page on the right side and will display the items that need to be submitted to complete your financial aid file, along with the due dates. When you receive your KCTCS Higher One debit card in the mail, use the card to activate your refund method according to the instructions that you receive with the card. Keep yourself informed about tuition deadlines. If financial aid does not cover your tuition, you are responsible for payment. Learn about Payment Plans under the payment options panel or by calling 1-855-469-6282. You may charge your books in the bookstore if you have financial aid to cover them during certain days. Be sure to check with the Financial Aid Office for these dates. You can get answers to your financial aid questions 24/7-365 by calling 1-855-469-6282. Questions about your bill? Contact your campus Business Office. We’re always happy to help!